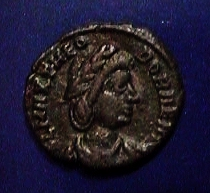 Flavia Maximiana Theodora was the stepdaughter of Maximianus. 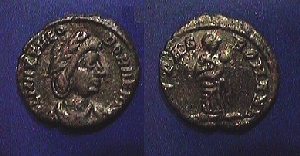 Theodora’s parents were Afranius Hannibalianus and Eutropia who later became the wife of Maximianus. Theodora’s real father, Hannibalianus, was consul in 292 AD, and had been the Praetorian Prefect under Diocletian. Theodora was married to Constantius I (father of Constantine the Great) in 293 AD following his forced divorce from his wife Helena. Their union resulted in six children, Hannibalianus, the future Emperor Julian II, Delmatius,Constantia, Eutropia and Anastasia. Theodora was largely ignored by her stepson Constantine the Great. Nonetheless, the children of Theodora were very much a part of the court of Constantine and would ultimately share in the dynastic heritage. Note: Theodora was accorded no coinage during her lifetime, but was honored posthumously after 337 AD by Constantine’s three sons. It is curious that she is given the title Augusta on these issues, as presumably she never bore it during her lifetime.